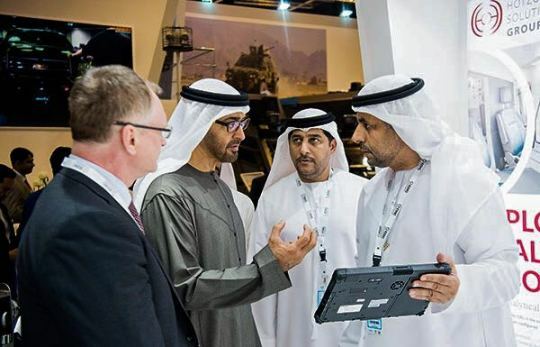 Hotzone Solutions Group, a Hazardous Substances Management Solutions company, was present at the International Defense Exhibition & Conference IDEX 2017, held in the United Arab Emirates, from 19 to 23 of February. 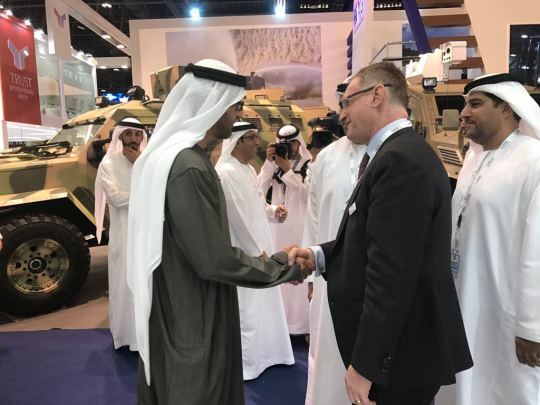 It was the first time that Hotzone Technologies, the technological arm of Hotzone Solutions Group, products were introduced to the high-level defense trade. 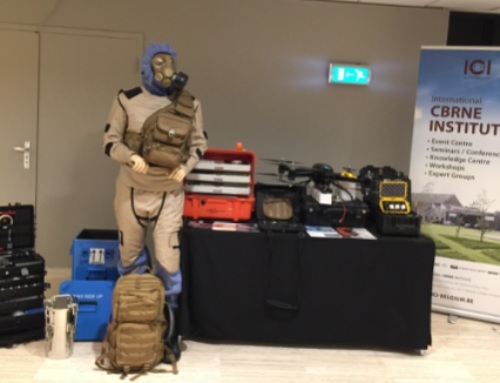 Five busy days at our stand and the CBRN community showed great interest in the new range of innovative products for CBRNE defense and for Environmental Protection and Remediation. 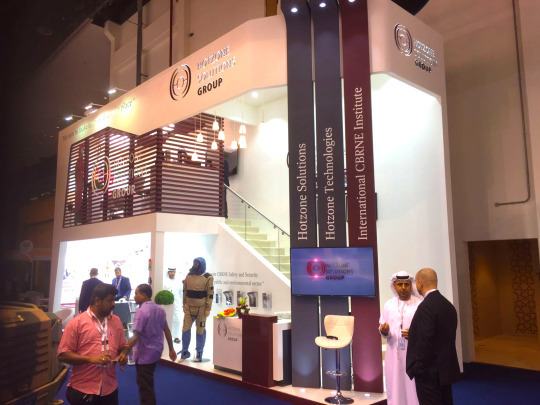 Hotzone Solutions Group launched at IDEX its new range of innovative products for CBRNE defense and environmental protection and remediation. 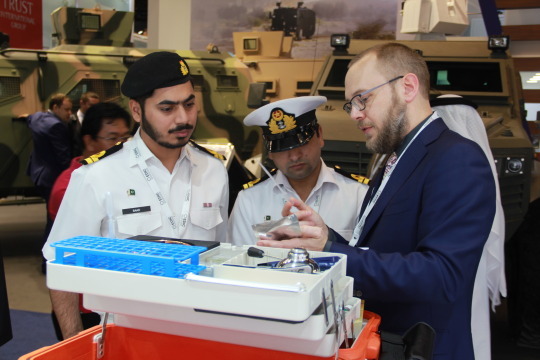 All visitors to the stand were very interested to know the new range of HZS innovative products for CBRNE defense such as, the Hotzone Identifier HazCat Kit for on-the-spot categorization of the unknown; the Invasive Technologies Monica & Midas Systems for remote case entry for sampling and disposal of CBW agents and toxic substances; the Sea Based Radiation Early Warning System to warn and protect the population from radiation hazards; the Hotzone Responder DAL, a self-sustained deployable analytical laboratory for CBRE threat agents, environmental pollution assessment and response to major industrial accidents; the CBRNE Fragmentation Protection System for protection of highly sensitive parts of the human body; the Aerial Radiation Survey, a UAV mounted gamma detector for aerial reconnaissance and radiation mapping; and the Plasma Mobile Hazardous Material Treatment Unit for hazardous waste treatment. 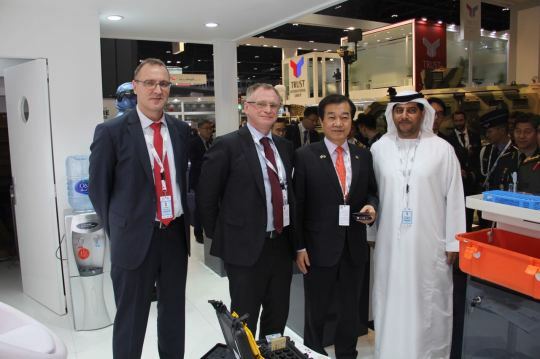 HZS Sales Manager Sjoerd Molen demonstrating the Hotzone Identifier HazCat Kit to a visitor. 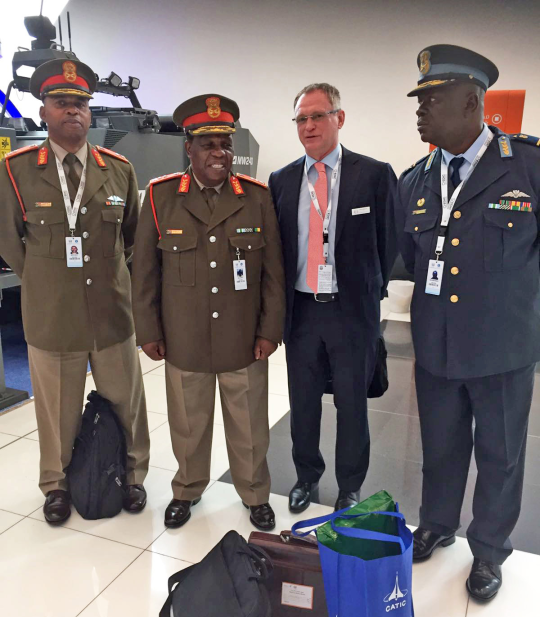 HZS Group CEO Olivier Mattmann welcomes the visit of Maj Gen J.S. (Jabu) Mbull, Department of Defence of South Africa.